Online only : $200 OFF orders over $500 ,$100 OFF orders over $300,$40 OFF orders over $200.Free Standard Shipping & Free Returns on All Orders. Get 3 for $75 clearance sweaters blowout.Limited time offer. $20 off your in-store purchase of $100 or more. 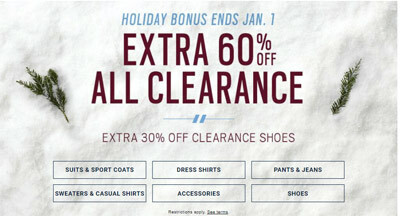 Extra 30%-60% off clearance . Up to 60% off OUTERWEAR. Up to 60% OFF SWEATERS. 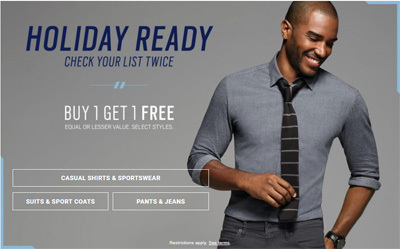 BUY 1 GET 1 FREE SUITS AND SPORT COATS. Free Standard Shipping & Free Returns on All Orders. BUY 1 GET 1 FREE CASUAL WEAR. Buy 1 and get 1 50% off shoes.No coupon code required. 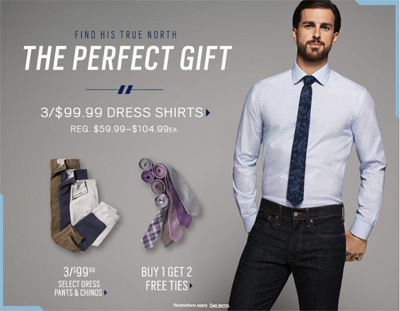 Get 3 for $99.99 dress shirts.Limited quantity,hurry up. Get 3 for $99.99 sport shirts.Reg. $69.99--$114.99 each. $39.99-$41.99 Levi’s jeans.See website for more details. Summer suit event: kinds of suits as low as $199.99. 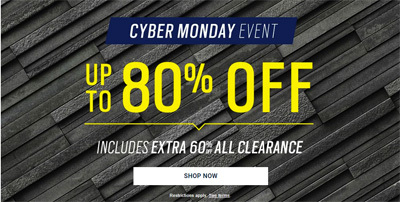 Cyber Monday : Up to 80% off sale.Limited time offer. Up to 60% off clearance . Cyber Monday : Up to 60% off clearance.Limited time offer.Free shipping is included. Black Friday Sale : Up to 80% off sale.Limited time offer.Take an extra 10% off your purchase of $175+. Up to 65% off specials shop . Up to 70% off weekend specials. Black Friday : up to 60% off clearance. Black Friday: 50% off socks, cufflinks & tiebars. Free Ground Shipping on $99+ and Free Returns. Buy 1 for $70 or Buy 2 for $60 or Buy 3 or More for $50 Each.